I have a new interview today with suspense author Jonathan Ross. 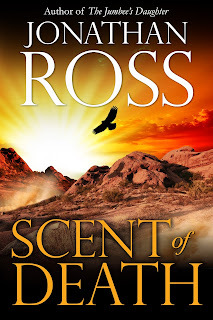 We’re chatting about Scent of Death which is due to release June 15. Jonathan visited last summer when we chatted about The Jumbee’s Daughter. Thanks very much Lisa; it’s good to be back. I grew up in the Mojave Desert, St. Thomas, and Cocoa Beach. I remember the Mojave Desert because it literally began where my back yard ended and was full of fascinating stuff to check out, from horned toads to tumble weeds. The burning sand and barren distances of the desert stuck in my mind and helped set the tone for Scent of Death. After graduating from Carnegie-Mellon University, I joined the Navy, crossed the Atlantic and Pacific Oceans, and lived three years in Spain. I am presently working as a naval architect designing a floating renewable energy plant for a Caribbean island. Besides writing, I love to ballroom dance, play the fiddle, and travel. My wife and I live in Arnold, MD. 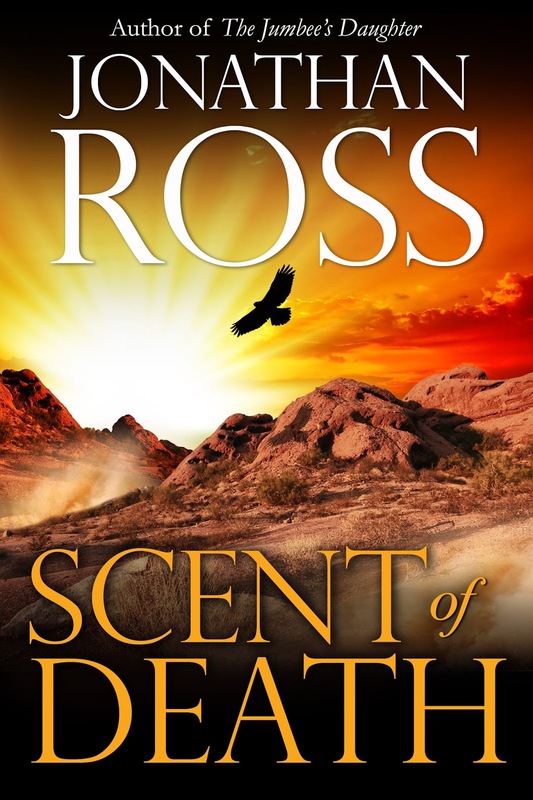 In Scent of Death, James Goodwin uses his olfactory equivalent of perfect pitch to sniff out people’s emotions, from love to malice. He earns a handy living by uncovering corporate cheats, but he’s growing bored. When billionaire Garth Cotton asks him to cook up the world’s first love potion, James first smells a grand challenge, and accepts. But once on the high seas in Cotton’s mega-yacht, James smells treachery. He sniffs out secrets that land him and Cotton’s dazzling assistant, Samantha Heartgrave, on a timeline to death. To save himself and Samantha, James must exercise his gift of smell in ways he never dreamed possible. My inspiration came from a question that popped into my head one day: “What if a person could smell evil?” I expanded the question to include all emotions, and wondered what a person would do with this gift. How would they learn to connect smells with emotions when they were growing up? Would such a gift help them untangle the emotions of puberty and dating? Would they use their sense of smell to start their own business? What sort of adventures and dangers could result from having this gift? My next project is a dive into the adventures and mishaps of folks on fictional St. Mark, the smallest of the US Virgin Islands. Ex-pats, descendents of pirates and slaves, and a smattering of the rich and famous live off the grid, lighting their homes with kerosene lanterns, catching rain for their drinking water, and oblivious to TV, Internet, and Wi-Fi. Charter boat captain Richard Drake finds himself at the center of island events, including unbidden visitors, unwanted developers, unwelcome storms, and unintended consequences. His blue-eyed, tanned charm is tempered with courage forged as a combat Marine, and he reminds many of his island friends of that English pirate, John Coxon, who founded the little colony after a profitable career plundering the Spanish Maine. This will be a series, and I am now writing the first book, Paradise and the New Girl. My biggest challenge is always to find time for research, writing, and rewriting. I would like to dedicate each morning to writing. Sometimes I can do that, but there are so many obligations, like deadlines in my job as a naval architect. All of my novels require detailed research, starting from the beginning when I only have the initial idea, and continuing as my thoughts come together into the narrative. Thank goodness for the Internet, where I can find almost anything I need if I can just come up with the right key words. Besides the Internet, I order books on specialty subjects, such as How to Build a Virgin Islands Sloop (Geoffrey Brooks) for my upcoming novel, Paradise and the New Girl. I am lucky because I have a wonderful home office with an ergonomic chair, a wide-screen computer, decorative pictures on the walls, and lots of files and shelves for storage. It’s spacious, yet feels homey and cozy, so even though it’s where I do my naval architecture work, it’s also perfect for being creative and writing. My favorite author these days is Bernard Cornwell, who wrote the Richard Sharpe series. I love his tales of military adventure in the early 1800s. Cornwell has a great eye for the sweep and the detail of battle. He has a gift for making the past come alive, whether it’s about the hardship of the soldier in the field, or the terror of hand-to-hand fighting with sword and bayonet. I also love reading Western novels by Louis L’Amour, and again much of the draw is the detail he weaves into his stories about how people lived in the American West. Yes: remember to have fun when you read and write; enjoy the journey.